PRODUCT: Wade 3000 Large Diameter (3008) Complete Cast Iron Roof Drain Kit. Includes Flange, Flashing Ring, Gravel Stop, Cast Iron Drain Dome. 8 inch Inside Caulk Outlet. Price/Kit. Ships by Truck Only. Select FreightQuote Shipping during checkout. The Wade 3008 Large Diameter Roof Drain Complete Kit has an integral clamping collar and gravel guard to provide clamping action without puncturing roofing felts, and a large open area dome to permit unobstructed flow. The Cast Iron Dome is also made of weater-resistant material for durability. Get your Wade 3000 Drain Kit at BestMaterials.com! Wade Roof Drain Sump Receiver Plate. For Wade Roof Drain Models: 3000, 3200, and 3220. Also known as a Bearing Pan. Price/Each. Wade -53 Underdeck Clamp with Hardware. 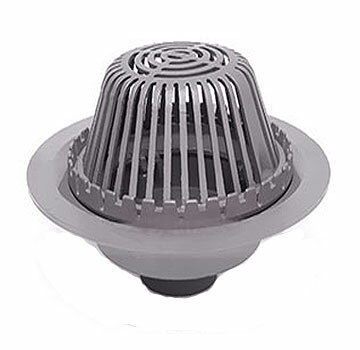 Fits Wade Roofing Drain Models: 3000, 3200 and 3220. Price/Each.